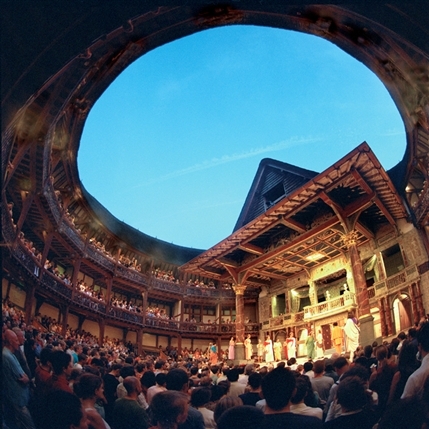 In the world of King James Bible celebrations in this anniversary year of 2011, one of the most widely anticipated events will begin this Sunday: reading through the entire King James Bible on the stage of Shakespeare’s Globe in London (left). Five groups of actors at a time, many of them Globe regulars, will make their way through every word of the Old and New Testaments, from Genesis 1 to the end of Revelation, over a series of epic readthroughs (audience members, we understand, can quietly come and go). This Sunday alone will include readings from 10 am to midnight, with one half-hour break. Throughout the week, six-hour sessions ending at midnight will carry the text forward, followed by a marathon reading on Good Friday, more on Easter Sunday, and the final round on Easter Monday. For more information, consult the Globe’s own Blogging the Bible! We’ve noted before the startling number of marathon King James Bible readthroughs this spring, both secular and religious (“Reading the (whole) KJB aloud”). As of today, for example, two churches in Fife are midway through an attempt to become the first churches in Scotland to read the entire King James Bible aloud. The Bath Lit Fest, as we reported, had its celebrity-laden King James Bible Challenge, and in late May, there’s the Hay Festival’s planned KJB reading in 96 hours, to be conducted by churches on both sides of the English-Welsh border. And there have been many more, and, no doubt, more to come. This entry was posted on April 15, 2011 by manifoldgreatness. It was filed under In the News, The KJB Today and was tagged with Authorized King James Version, Bath Lit Fest, Easter, Easter Monday, Good Friday, Hay Festival, King James Bible, London, New Testament, reading aloud, Reading marathon, Shakespeare's Globe.